The medical cannabis industry is a serious business – so of course, somebody had to make a sitcom from it. 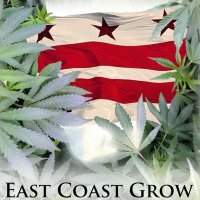 The kitchen at the Mess Hall in Northeast Washington D.C. (which provides up-and-coming food entrepreneurs commercial kitchen space to hone their craft) has been transformed into a marijuana cultivation center for a new fictional web series currently being filmed. East Coast Grow sees four idealistic friends take on business and bureaucracy in D.C.’s new legal cannabis industry. According to a BackStage casting notice, one of the lead characters is Mike, who has emerged from the not-so-legal trade to build a legitimate business. The other lead is Tia, an avid supporter of justice in marijuana policy who quit her career in corporate communications to manage a medical cannabis cultivation center. Supporting characters are Darrin, Mike’s best friend; Cody, the wide-eyed and naive new employee and Aldo, owner of one of DC’s leading dispensaries. The show stars Theo Copeland, Devin Nikki Thomas, Dave Johnson, Joseph McCaughtry and Greg Crowe. Executive producer Matt Doherty says the aim of the show is to destigmatize cannabis and those who use it. Apparently, the casting call saw applications from 400 hopefuls. Residents of Washington D.C. have the right use marijuana for medical purposes if the person’s primary physician provides a written recommendation. According to a November update from the Government of the District of Columbia Department of Health, 4670 patients are registered for the program. Washington D.C. has seven marijuana cultivation centers and five dispensaries. Patients must choose a single dispensary to register with and cannot obtain cannabis medicine from other dispensaries. Patients are permitted to purchase up to two ounces of dried medical marijuana per month or the equivalent in other forms. There is no minimum age to be a registered medical marijuana patient in Washington D.C. Patients and caregivers are not permitted to grow or cultivate medicinal cannabis. However, in addition to the availability of medical marijuana, on November 4, 2014, D.C residents voted in favour of Initiative 71 to legalise the possession and cultivation of limited amounts of cannabis by adults who are 21 or older. Initiative 71 became law on February 26, 2015. Previous articleMedical Hemp For Pets?